Since the release of Xara Web Designer in March the Web Designer forum on Talkgraphics has been very active. Many long time members and new members are providing excellent feedback and support for the community as a whole. One question that has been asked repeatedly on the forum is “how do I create my own templates?”. In this tutorial I hope to provide some insight into one way to make a template. You are probably aware of Xara Xtreme but have you downloaded Xara Xtreme Pro? All the tutorials in this Workbook are done in Xtreme Pro, so if you don’t have it, get it now. or to upgrade to Xara Xtreme Pro today! Xara Graphics Studio Xara’s three most popular products in one irresistible bundle. Xara Graphic Studio contains Xara Xtreme, Xara-3D 6 and Webstyle 4. This bundle will save you a bundle! 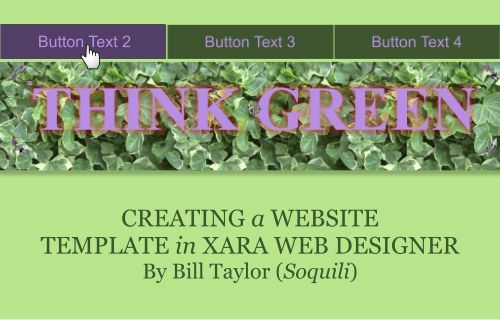 Xara Webstyle 4 Everyone can make quality web graphics with Xara Webstyle, whatever your skill level. From banner ads to complete web pages, simply customize the templates. Xara 3D-6 Xara 3D is the Number 1 tool for creating stunning, professional-quality 3D web graphics. See why for yourself. You can use a 3D program and drive yourself nuts trying to figure out all that X Y and Z axis nonsense, or you can make your life easy (and fun) with Xara 3D. It’s up to you. Xara 3D Heading Maker Add this great interactive tool to your web site and let your visitors make 3D graphics online. Xara Online Web pages stand out with Xara Online's state-of-the-art web page add -ons. Choose graphics, text and photo effects, or advanced applications, all fully-customizable and on your site in minutes. BuyFonts.Com All designers need fonts - get yours for as little as $2 US. Question: Is life a contest to see how few fonts you can use? With low prices and high quality fonts that you get at BuyFonts.com, do you need to ask?